Gabriele Lavia sets Electra in front of a rusty destroyed building in a sort of post apocalyptic world: Agamemnon ruthless ambitions and the adulterous relationship between Clytemnestra and Aegisthus have yielded only destruction and an uninterrupted chains of murders to the once glorious house of the Atreides. A musical sequence of dissonant chords composed by Giordano Corapi and sung by a red and black dressed choir contributes to the dystopian atmosphere. Electra’s character plays a marginal role in other tragedies on the same popular subject, but here, in Sophocles’ work, she becomes the centre of the action whereas Orestes is just an instrument of the divine justice. 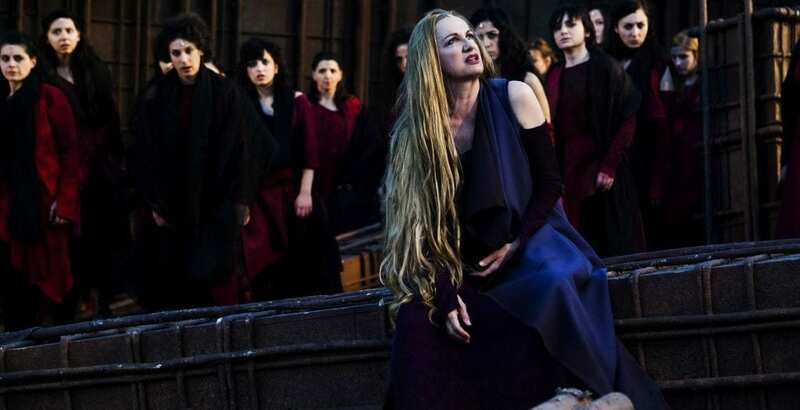 Electra’s only reason of life is the revenge of her father’s assassination by the hand of her mother Clytemnestra. A black dressed, red haired Federica Di Martino portrays these feelings with an intense recitation, at times excessive. We can see a relentless pain in her contracted body, an implacable hate for the mother in her broken voice and her extreme loneliness when she runs around like a stray dog, beaten but still untamed. She confronts with harsh words her submissive sister Chrysothemis, an exquisite Pia Lanciotti, who had chosen prudently and cowardly to accept the current situation, while Electra appears to be the only guardian of the true justice that can be achieved only through the matricide. 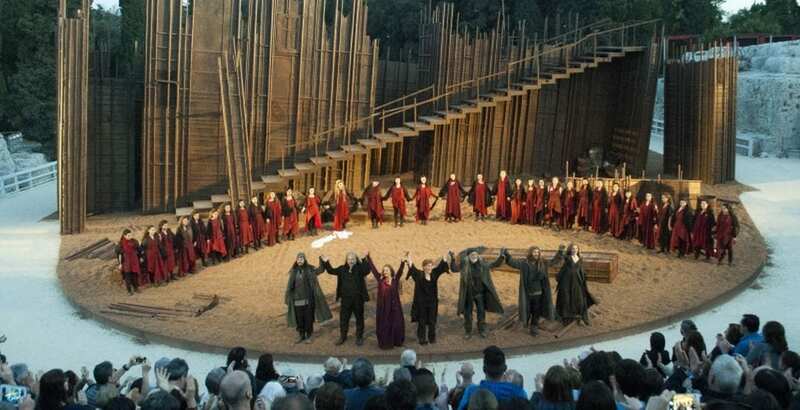 However, it is in the confrontation between Electra and her mother Clytemnestra that this production reaches its climax. An outstanding Maddalena Crippa powerfully portrays the complexity of Clytemnestra. She is an adulterous murderer who hates all of her children and she shows no pity but only joy when a remarkable Pedagogue, Massimo Venturiello, announces the false news of Orestes’ death. Despite all she has no remorse in further humiliating Electra and no shame in praying the gods to protect her. She justifies her actions on the basis of a false sense of justice: in fact Agamemnon had sacrificed the daughter Iphigenia before the Trojan War. In actual fact this is only hubris that conceals her real motives: lust and fear to lose everything. There can be no sympathy for such an unnatural mother, her hate calls for more hate upon her.Therefore the inevitable conclusion is the matricide, unfortunately cut in this production and substituted with an ominous music while it was happening behind the scenes. It is also worth to mention the passionate interpretations of Orestes’ by Jacopo Venturiero and an arrogant Aegisthus, Maurizio Donadoni, coarsely bragging and mocking Electra before discovering that under a blood stained sheet there is not Orestes but the beloved Clytemnestra and that death will be soon upon him. The open intention of Lavia is to bring a Greek tragedy closer to a modern audience but this is achieved at the expenses of the noble, almost hieratical, stature of the characters in more traditional productions. For an evening of unconditional hate and love, visit the ancient Greek theatre in Siracusa, Sicily. It’s one of those places where you can still feel the genius loci. The natural setting for Greek tragedies, it is now in its 52nd year as a home for new productions. This year the Istituto del Dramma Antico presents three tragedies centered on three different female characters: Electra by Sophocles, Alcestis by Euripides (alternating every day until the 19th of June), and Phaedra by Seneca (from the 23rd to the 26th of June).